A Spanish outlet Sport is reporting that Liverpool and Barcelona have agreed on a fee over a January transfer deal for Philippe Coutinho after months of negotiations. Barcelona tried their luck in bringing the Liverpool Number 10 to Camp Nou over the summer after selling Neymar to PSG but Liverpool refused to let their player go, rejecting all Barca offers. 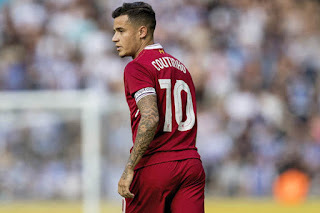 Sport, however, now claim that Liverpool has given in and will accept the sum of £133m for the attacker, who is also reportedly set to sign a five-year deal that will see him earn £10.6m over the course of his stay at Camp Nou. Earlier this month, Jurgen Klopp admitted that he was unsure if the club would keep the player at Anfield past the January window. "Not for one second have I thought that so far," he said. "I an not unsure, I am not sure, I don't think about it." "I have a team to prepare and no one knows what will happen in the nice and calm January transfer window. It's nice from an outside view but I have absolutely nothing to say."